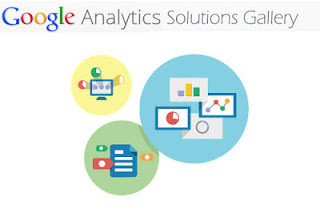 Google Analytics finally introduced Solution Gallery! If you're like me, and like to check up on your blog's Analytics data every so often, then you must have wondered many a times as to what are the best metrics you could use to, say, see your stats from a certain perspective. For beginners, setting up Google Analytics can be a daunting task, since there are so many options, and the availability of the thousands of metrics to choose from doesn't make it any easier. Many people feel that their dashboard is lacking, and perhaps they are missing out on a lot of stuff, which is why they often turn towards online help, and see what other bloggers have in their dashboards. Well, hopefully, there will be no more looking now, as Google just announced a new feature, the Google Analytics Solution Gallery! Now you might be wondering, what could that possibly be? Well, the term is new, but the idea hasn't been unheard of. It features solutions that are focused on generating stats and reports dedicated to branding, email marketing and lead generation, eCommerce, and so on. Hence, the term 'Solution Gallery'. You can think of these solutions as presets in your music player's equalizer. You don't know what the best setting would be for you. So you have some pre-defined presets, such as pop, rock, metal etc to help you out and make life easier. The Gallery has nice features that lets you get the type of reporting you need, or the marketing campaign(s) you want to track. You can look for an Analytics solution, Business objective, or a Marketing Function. Once you are ready to go with the solution(s) you want to try, you can just download them, and apply to your Google Analytics profile. To access this gallery, simple visit this link to Google Analytics Solution Gallery, and then choose the kind of solution you want. The Solutions Gallery offers you Custom Advanced Segments, that you can use to see the effectiveness of your various ad-spots, such as the top (header) ads as compared to the right sidebar ads. This let's you know what sort of ads are better suited for what ad spots. Another great feature is the Advanced Custom Filters. You can add Advanced Custom Filters for long-tail words ranging from 3 to 6 words, and so on. You can then generate reports on those keywords, and create a separate dashboard to allow you to analyze your long-tail traffic. For novices, these features can be a great help. A lot of people use Google Analytics as it came, without any (or maybe very small) modifications. Many don't know about all the advanced features, and how to use custom reporting. But with this tool, it has never been easier. Even beginners can make use of it and get advanced reports on their websites, and they can then use that data to improve their website.